Take control of the most powerful console in the world, the Xbox One X. The latest, sleekest member of the Xbox family unleashes 40% more power than any other console. With Xbox One X, games look epic, play smoothly and load rapidly, even on 1080p screens. The most powerful console in the Xbox family is also the smallest. This sleek and compact console features advanced cooling technology, so your console stays cool and quiet as you experience the power of Xbox One X. The biggest blockbuster titles play better on Xbox One X. See in true 4K, experiencing incredible graphics with even greater focus and detail. Discover immersive 4K environments and characters and richer, more luminous HDR visuals. Increased memory bandwidth makes graphics faster, for swift and engaging game momentum. Gaming is smoother than ever. Faster processing delivers enhanced AI, seamless interactions and intricate details that bring your in-game experience to life. The larger graphic memory allows you to explre vaster worlds at quicker load times. 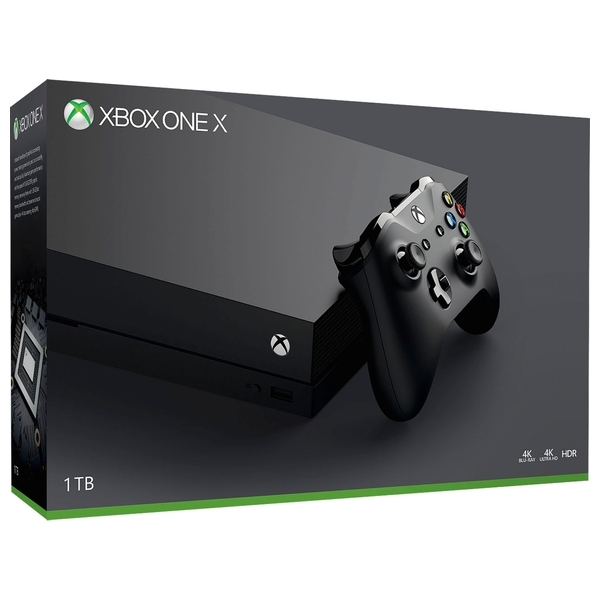 Xbox One X is compatible with all Xbox One games and accessories, as well as Xbox Live, the world’s most advanced multiplayer network. Enjoy a 14-day Xbox Live Gold Trial and a 1 month game pass subscription trial.